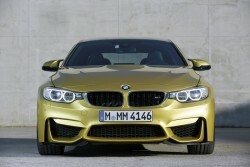 A new BMW M car and a new name; can the M4 Coupé continue where the mighty V8-engined M3 left off? 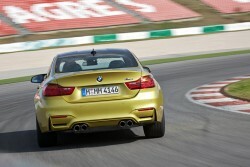 We absolutely adored the E92 BMW M3 Coupé with its sonorous high-revving V8 engine and laughably mobile rear end. The new M4 Coupé takes on that car's mantle and though signals a return to six-cylinder power, brings with it two turbochargers. Fear not: it's the real deal. It's down to personal preference, but I found myself drooling over the new M3 Saloon more than I did the BMW M4 Coupé. Not that the latter is a shrinking violet; it's still an eye-catching performance car that very much comes from the school of M car design. 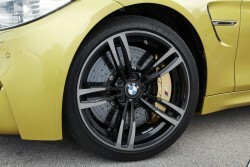 BMW always manages to make the M models look technical too, which I'm a fan of. It's not just for the hell of it either, as the new M4 spent a considerable amount of time in the wind tunnel perfecting its aerodynamics. Evidence of this can be found in the shape of the integrated spoiler in the rear boot lid, the design of the diffuser in which the characteristic quad exhaust set-up sits and of course the Air Breathers and Air Curtains at the front that were introduced on the regular 4 Series Coupé. 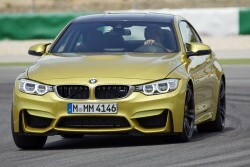 The M4 is undoubtedly a more menacing shape than that car, but it's still less masculine than the M3 Saloon. There's not much to tell them apart inside - access aside. As in the saloon, the leather sports seats with width-adjustable side bolsters and an illuminated BMW M logo set the car apart from lesser models immediately. The driver holds a circular M steering wheel and if the DCT gearbox is fitted there are metal gearchange paddles behind it. That transmission also comes with the stubby little selector in the centre console, which is flanked by a suite of buttons to access the different driving modes for each sub-system. 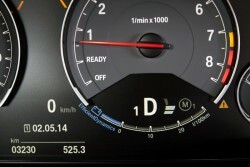 The instruments are unique to the M3 and M4 and incorporate a 'change up' sequence of lights around the rev counter. The rear seats in the coupé split and fold just as they do in the saloon. 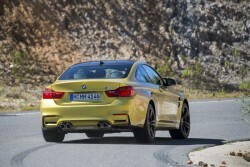 I used up enough of the internet space rambling on about how the BMW M3 Saloon drives in that first drive, and, as the M4 Coupé is virtually identical mechanically, then click here to read all about it. There are detail differences of course, though we're told they're minute - the M3 has the stiffer body structure, the M4 has a lower centre of gravity and the weight distribution is a little different because of the M3's extra doors. We expect altering the driving modes will have more of an effect than any of those things. Speaking of which, I did fail to mention what the dual-clutch gearbox is like. Brilliant in a word. It slurs gears in comfortably when in its most reserved mode, yet bangs them in violently under full throttle at the other end of the spectrum. So much so that the rear tyres sometimes chirrup under protest as the next gear is hammered home. It's best not to attempt that mid-corner. 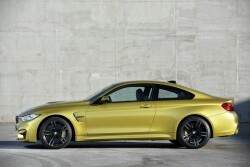 The M4 Coupé costs only £460 more than the M3 Saloon, at £56,650 in manual guise, rising to £59,145 for the DCT automatic model. Specifying that gearbox results in lower emissions, a faster 0-62mph time , better fuel economy and lower emissions. Both M3 and M4 share the same generous standard specification, including Adaptive M suspension, 19-inch alloy wheels, front and rear Park Distance Control, heated and electrically adjustable sport seats up front, electrically folding door mirrors and the full BMW Professional Media package, with upgraded Bluetooth. Though most test cars at the launch were equipped with the M DCT automatic, we did manage to test a manual version of the M4 Coupé too. 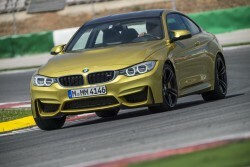 Sadly, only 20 per cent of buyers of the M4 (globally) are expected to go for the manual gearbox. We'd be among that 20 per cent. 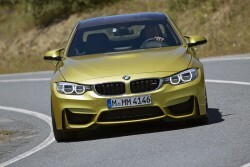 The six-speed unit that comes as standard on the M3 and M4 is a new transmission. It is smaller than before and some 12kg lighter. It also comes with a rev-matching function for the first time, where the electronics detect that the driver is changing down and the throttle is blipped automatically. Ostensibly this is to smoothen the change, enhancing stability, though it's also rather good fun to hear the engine at every available opportunity. Our time with the car was short, but it seems that the rev-matching can be switched off by choosing the sportier driving modes. Drivers that like perfecting their own heel-and-toe changes will be pleased by that. 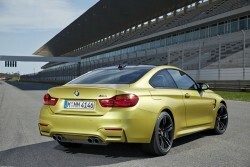 Is the BMW M4 Coupé a worthy successor to the M3? Yes, it certainly is. We'd still have the new M3 Saloon over it, but each to his own; by any measure, the new M4 is an exciting, desirable sports car.